Looking for the comfort of playing bingo anywhere at any time? Then Bingo Anywhere online bingo is where you need to play. Indulge in your favorite pastime whenever it strikes your fancy. It’s your passion, your free time and your bingo game, so why not have it all at your fingertips. The name alone says it all, with a motto that suits a bingo players lifestyle well; “Play anytime, anywhere”. That about sums up the convenience of playing online bingo but with Bingo Anywhere they are not just your average run of the mill site, not by a long shot folks. To begin with the homepage is laid out quite comfortably with anything and everything you want to know accessible with a quick click of a button. That in itself is tremendous user friendly navigation, eliminating unnecessary cyphering through endless pages. The web design is simple yet direct for what matters most; getting started. The site is owned and operated by Chelbis Company Limited and is licensed and registered in Cyprus. Powered by Cozy Games software, the collection of products and graphics are tailored made for the bingo player and those looking for an entire package of gaming options. There are three bingo variations to choose from with the largest traffic in the 90 Ball Bingo room. Other bingo rooms include 80 ball and 75 ball bingo. Progressive Jackpots are available in all rooms with bingo ticket prices starting at .05 each with a Pre-buy feature to purchase in advance. Choose up to 25 Instant Games located inside all bingo rooms with bingo bucks or real cash options. Slots are broken down into four categories; this is especially nice when searching for a certain style of Slots. Categories include: Slots Bonus, Slots Free Spins, Slots Jackpots and Slots Progressives. The largest selection by popular demand is the Free Spin Slots. Instant Games include Table Game favorites like Classic Blackjack, European Blackjack, Roulette with Video Poker and Scratch Cards. A log of all games is a nice reference guide to keep track of the gaming history for Bingo, Slots and Instant Games. All products are available to play using Bingo Bucks or real cash. A Welcome Bonus is available to all new players and Reload Bonus is offered on all other deposits. Ongoing promotions can be located under the Favourites tab located on the Promotions page. Chat Games are hosted by Chat Moderators offering free Bingo Bucks to the winners. Happy Hour is the time to play because all Jackpots are doubled including all Chat game bingo bucks. Refer your bingo buddies and receive a nice cash reward for everyone who deposits and plays. Refer for friends and be rewarded with an even bigger cash prize. Monthly Specials are always changing with fun offers that may include Slot Specials, BOGOF, Extra Bingo Bucks and so much more. 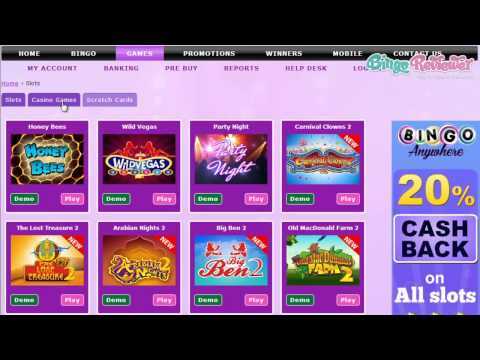 Bingo Anywhere is a well-structured site that offers a variety of promotions. The VIP Club is lucrative with monthly drawings, gifts, tokens and exclusive Bonuses. We rate Bingo Anywhere with 4 Pink Hearts. Ah, what's not to love about a free 15 pound bonus on signup and a chance to spin the wheel for up to 1500 pounds? I'd take those freebies anywhere, and Bingo Anywhere is where you will find them. This site features cozy games and so we know the software is safe and secure and fun and exciting. All good things! The anywhere they speak of is just that. With new mobile computing capabilities, you can play your bingo game no matter where you are as long as you have a signal and can get online. This is great for all of you on-the-go sorts who pack all the fun into their day that you can by using your mobile devices to communicate, entertain, and now to win! With a good supply of bingo rooms and different types of bingo and other games available, your fun will go on and on. And if you need help, your support team goes right along with you and is available anywhere 24/7 to answer your questions and help you with your needs. Be sure and participate in the chat games and you can also play instant games while you are watching the bingo balls drop and cover your cards. They have a good loyalty program and the bonus money for chat games is sweet and fun to win. This turned out to be quite a decent casino, although I did came first for the bingo. It was a fact that they use Cozy Game software that got my attention, and I was not wrong, the games are top notch and working smooth and very nice looking. The site is all purple, and relatively simple, which I really appreciate. For the good things, you start with a £ 15 trial, or no deposit bonus, that you can spend trying the games and even winning some cash. As always, you must make a deposit before withdrawing. There's a 200% first deposit bonus, up to £200, and a reload bonus of 250% (up to £1250). What I found very encouraging is that they give a 20% cash-back on all Slot games! The bingo is represented with 75, 80 and 90 ball games, which is good enough for me, and if that's not enough, there's even a mobile page, for all who like to play from their phones. This is definitely one of my favorite sites to play at! I was a big fan of their welcome offer. Upon registration, they will award you with a cool £15. Not only do they give you free cash to start with, but the gifts will continue on the first three deposits. On your first three deposits, they will give you a bonus that totals up to 750%. More specifically, they will give you a 200% bonus on your first deposit, 250% on the second and 300% on the third. I think this is great way to start out your gaming experience. It also gives you a nice little chunk of change to start playing some of their games on the house. You can’t go wrong with the bingo selections they offer here. Players can choose from a variety of bingo games including 30, 75, 80 and 90 ball bingo. They have a lot of awesome promotions when it comes to bingo as well!